Vulcan STANDC48 Equipment Stand w/ Marine Edge & Under Shelf, 49 x 24"
Equipment Stand w/ Marine Edge & Under Shelf, 49 x 24"
The Vulcan STAND/C-48 equipment stand accommodates Vulcan countertop equipment to save essential space on countertops. To create storage space and organize work areas, there is an undershelf. Marine edges contain small spills to keep your floors clean. 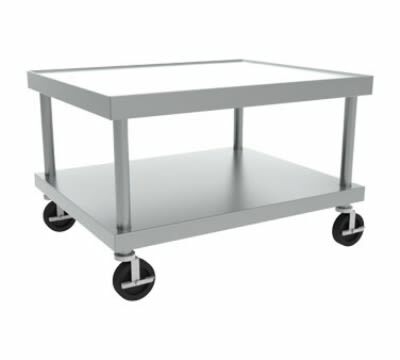 Brakes on the 5-inch casters allow the table to be locked in place while the equipment is in use. Constructed of stainless steel, this stand resists minor damage and corrosion. The edges are welded, providing strength and durability to withstand heavy-duty use. Welded areas on the Vulcan STAND/C-48 equipment stand have been blended to a smooth finish, matching the other surfaces for a professional appearance.